A computer chair is an essential item for the majority of homes and a necessity when it comes to office workers. Unfortunately not all chairs are built the same. Some are just downright flimsy and fragile. As a big man, this is not what I need. What I need are heavy duty office chairs with 1000 lbs capacity to ensure both safety for myself and longevity of the chair. Now a heavy duty office chair doesn’t necessarily have to be a high weight bearing chair. But if you’re overweight like myself it’s a must. 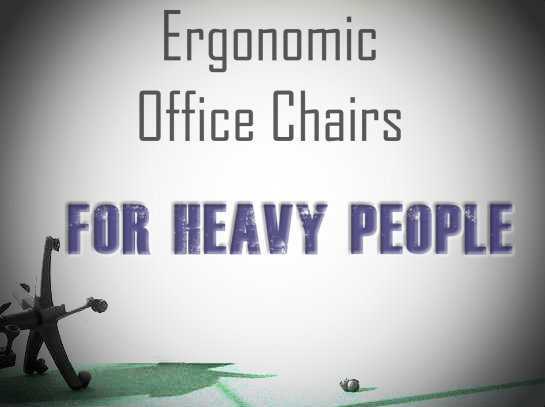 Regular size people may also need a heavy duty computer chair simply for the durability and longevity. Us bigger people aren’t the only ones that get sick of chairs breaking or malfunctioning just after the warranty expires. 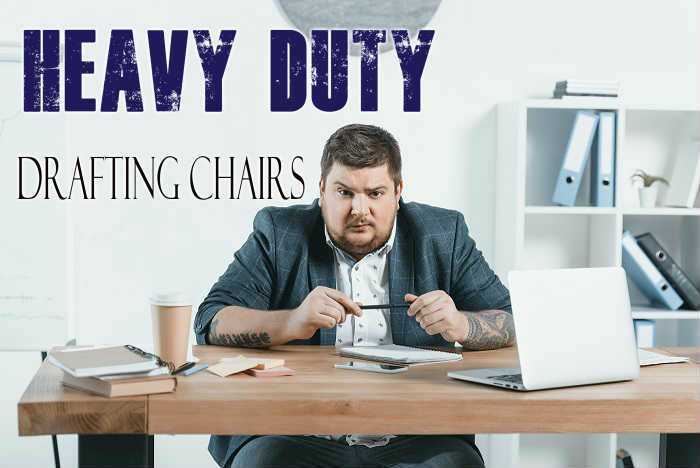 So a heavy duty chair is meant to be built stronger, have extra reinforcements, boast tougher materials while also offering comfort so that the user and the chair can both survive the grueling day of work ahead. With that in mind, below you can find the best heavy duty office chairs which also have high weight capacities to ensure the bigger people have easy access to the chair for their size. Starting with a 500 lbs weight capacity office chair. When it comes to a heavy duty 500 pound computer chair, the options are increasing every year. A few years ago, the selection was few and far between. But now manufacturers are starting to see the needs of the heavy person and trying to cater to out needs. Below you can find my #1 recommendation. But for more options check out my reviews on other office chairs with 500 lbs capacity. For a long time now the OFM 811 LX part of the Avenger series has been my top rated 500 pound capacity chair. It’s just a great chair. It’s comfortable, re;liable and durable while not costing you the world. The thing I love most is the 5 inches of thick padding on the seat. I don’t think this bad boy will ever flatten out. The actual distance between the arms is quite impressive as well. Measuring just over 23 inches wide it is up to 3 inches wider between the arms then other 500 lb office chairs. So a well padded seat and wide body area is certainly a must. Another great thing about the Avenger by OFM is that it comes with some pretty cool features. Features you may normally not see on a high weight capacity chair due to the weight bearing down in it. So the chair has a full 360° swivel, meaning you can spin around in circles for hours on end. No don’t do that, you get dizzy. It also has a tilt lock and tension feature so you can kick back and relax without the fear of toppling over. This is a big bonus for me as I like to sit back and watch videos on my computer. There’s also the gas cylinder which has held up quite well considering the amount of weight it has had to endure. Overall I like to think of the Avenger as a pure tank in the office. It looks tough, it is tough and it’s very big. So big that you may think it’s a loveseat from behind. If this chair isn’t heavy duty enough for you then I don’t know what is. Everything about this chair is just great. The 1″ thick padding on the arm combined with the padded back and ever comfortable seat makes it easy to do a 10 hour day in this chair. The only thing I would worry about is the weight of it. It’s not light. So if you need to manually move this chair it may be a 2 person job. Other than that it’s one of the best heavy duty desk chairs on the market. The only thing tougher than a well padded avenger chair is a well ventilated mesh chair. Especially during the warmer months when air conditions still doesn’t stop the sweat running down your back. This is why I prefer the Air Grid by Space Seating. The Air Grid was built for heavy duty use and larger people. With a weight capacity of 400 lbs, this mesh office chair is certainly a favorite around here. The main reason being the mesh material which is used on the backing and also on the padded seat. Having this mesh allows air to circulate and reduce the body temperature. No more sticking to a leather chair or pooling up in sweat. While the seat is nicely padded with breathable mesh outer, the backing is full mesh to allow maximum air flow. On the back rest is an adjustable lumbar support. I like the fact it is adjustable as multiple people use my chairs and they can adjust the lumbar to suit their back support needs. Provided they put it back in position after use. In terms of space between the arms, the Air Grid is quite large as well. Measuring 22 inches between the arms allows for a better fit. No more being squished in like a sardine. The only thing I wish Space Seating had implemented was a mesh and padding on the arms like the seat. This would have made this chair the ultimate dream to sit on. However, it does boast tilt lock and tension which is a huge bonus. Lastly, it just looks amazing. It’s that well made and utilizes quality materials that it looks like it has been taken from a well appointed office. Being very heavy duty, having a 400 pound capacity and spacious enough is the ideal chair for any heavy person. 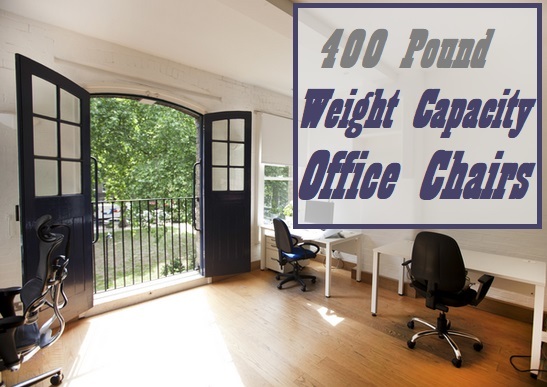 *For More 400 Lbs Options, Visit Our Range Of 400 Lbs Office Chairs. Being one of the widest office chairs in terms of space between the arms, the Admiral 3 by Comfort Products is certainly built for heavy people. The actual chair has a width of 27 inches with a measurement of 25 inches between the arms. Combine this with a 500 pound weight rating and you got your self one heavy duty managers office chair. Besides being built like a tank and offering a spacious seating arena the next best asset of the Admiral 3 is certainly how well this thing is padded. There is ample padding to make any task behind the desk seem doable but what really stands out is the amount of lumbar support padding there is. There’s a nice natural curve along the back rest which focuses on the lumbar area. This is particularly important if you suffer from lower back or mid back pain. The curve of the padding slots in nicely to provide that lumbar support your back so deserves and needs to be productive. The seat from the ground in the low setting is 19 inches high. What this means is it is ideal for big and tall people, but shorter people may find it difficult to reach the floor being this high up. As it is a high back chair, a short person may feel like a kid sitting in this giant of a chair. So I would avoid the Admiral 3 if you are short and petite. Like the rest of the chair, the piston on the Admiral 3 is huge. It’s certainly built to suit heavy duty tasks and heavy weights. It just looks tough and looks like longevity is it’s main role. In a nutshell, if you have been looking for a high quality heavy duty office chair that offers copious amounts of seating space with padding you have previously only dreamed about, then the Admiral 3 is certainly one to be taken seriously. When it comes to buying a 1000 pound capacity office chair, the selection is minimal. In fact there are only two options I know of and they are both by Living XL. Living XL has a armed version and a no arms version. Both which hold 1000 lbs. However, from my findings the chairs get mixed reports. Mainly concerning the casters being cheaply made. So in order to fix this I would buy an additional set of heavy duty caster wheels and replace them immediately. One of the positives about these chairs are that they are screw adjustable. Meaning that a screw will hold the seat at the dedicated height setting. Which as any heavy person knows, the pneumatic cylinders tend to fail after time and you have to either put out for more money on a new cylinder or accept sitting at the lowest height. But with these chairs this issue seems to be avoided. When you have heavy duty casters in place, the chair is actually pretty solid. While being considerably wide and being able to sit at the front of the chair is a bonus. However, I wouldn’t recommend this chair if you are under 500 lbs. This is because the chair doesn’t tilt back as a safety concern. The chair could easily topple under the stress of 100 lbs when tilting back. So it’s kind of a chair that is a ‘must’, not a leisure. So if you desire more comfortable chairs at a lower weight capacity keep reading. Unless you have thousands to spend on a bariatric office chair, the next best option is the chair by Living Made EZ. It is labelled as a 600 lbs capacity bariatric office chair, but could also be used as a dining or gaming chair if need be. 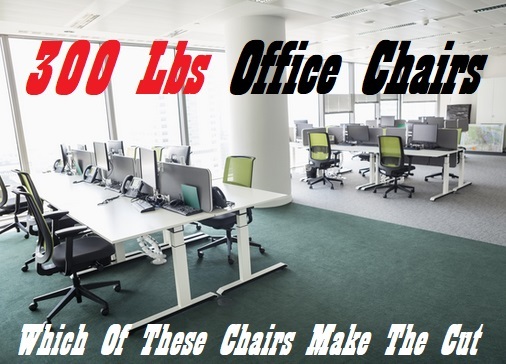 I have seen 600 and 800 lbs office chairs that are classified as bariatric that cost over $2000. So I think this chair in comparison is really good value. While it certainly doesn’t look like your typical office chair, it performs the tasks all the same. It has four 5″ caster wheels that look rather durable and big enough to handle the heavy weights. The padding is sufficient while the arms are a stable but helpful assistance when trying to get out of the chair. Being 30 inches wide I don’t feel the need for an arm-less version as it’s quite wide. However, I would like to see some sort of height adjustable feature as this one is set to 18 inches from floor height. Which for some will be a deal breaker. Previous post What Are The Best Oversized Beach Chairs For Heavy People?